Layer 1 Troubleshooting with Cisco Switches. | CCIE or Null! Layer 1 Troubleshooting with Cisco Switches. Apparently Cisco switches have the capability of performing TDR tests on cables to test cable length and pin-outs. This is something I stumbled upon while browsing through the Cisco Learning Network and I just had to give it a whirl. After all sooner or later you are going to run into a cable issue, it’s just a matter of time. Whether it was not crimped, punched down correctly, or someone ignored the IEEE standard and made a cable too long. The bottom line is some user somewhere will not connect to the network and then it will be up to you to troubleshoot why (and to fix it). 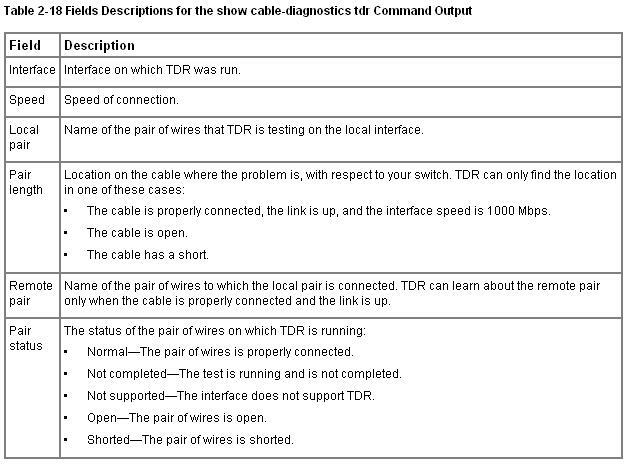 To test a cable simply issue the following command: test cable-diagnostics tdr int %IntefaceType/Number% from privileged mode, and include the interface in question. Pretty straight forward, it tells you the interface the cable is plugged into, the speed of the connection, the local and remote pair of the cables, cable length (notice the “+/-” of a few meters), and finally the status. This command is currently available many different switch models 2900’s, 3500’s, 3700’s, and further (Including both 10/100 MB and 1 GB ports). I would also like to mention if you perform this test on a live port, communication is not interrupted at all. The Cable Length measurement is actually very accurate, don’t let the “+/-” factor confuse you, I’ve ran this on multiple cables and the length calculation is right on the mark. This is a definitely a nifty feature to keep in your when you run into those wired connectivity issues. « Automatically recover err-disabled ports. Anyone know of a program that would detect pinout of remote end of cable?